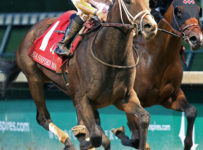 This afternoon and on Saturday, fans at Gulfstream Park will be watching the live races and watching TV monitors for the Preakness (Grade 1) and other races at Pimlico in Baltimore. 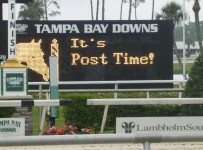 Tampa Bay Downs will simulcast all of the two days’ Gulfstream and Pimlico races. Tampa Bay Downs’ next live race day is June 30, the start of its annual two-day Summer Festival of Racing. 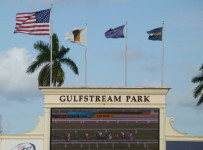 We will have coverage of the Saturday and Sunday racing at Gulfstream and at Pimlico on this Web site and on our blog. Gulfstream has nine races today with first post at 1:15 p.m. Conditions are fast and firm, with clear skies in the forecast. Thus, the four races scheduled for turf should stay on that surface. On Thursday, Gulfstream moved four of six scheduled-for-turf races to the dirt track. Pimlico began today’s 14-race card at 11:30 a.m. The feature Black-Eyed Susan (Grade 2) has a scheduled post of 4:50 p.m.
On Saturday, Gulfstream will have ten races with first post of 1:15 p.m. Pimlico will have a 14-race card with first post at 10:30 a.m.
On Sunday, Gulfstream will have nine races with first post of 1:15 p.m. and Pimlico will be dark.